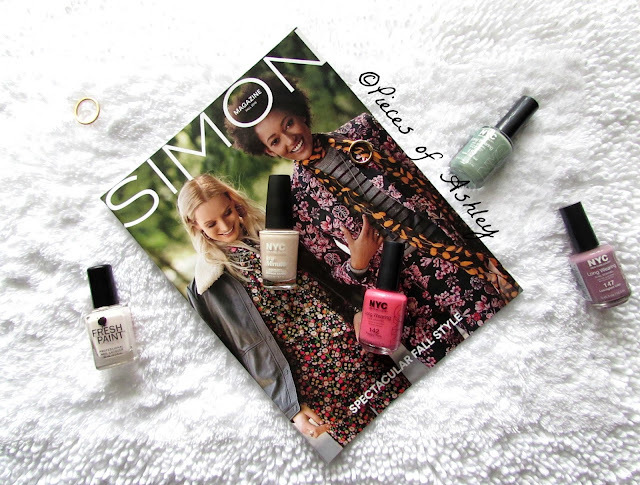 To get into the spirit of Spring here's my Top 5 polishes for Springtime! One of my favorite brands is NYC. I am so obsessed, they have so many pretty colors. These polishes are of great quality, but also very inexpensive. They range from $1 to $2. My first is not from NYC, but it's such a pretty color! All of these polishes last a long time. Mine usually lasts for a week, which is really good for me. I am obsessed with this color. It's a very light pink and you only need 2 coats to apply. This color is very versatile and can be worn at anytime. I am not really into bright colors such as this preppy pink. But after I started wearing it for a while it grew on me. This color reminds me of a tropical island. Usually I would not be into colors like these, only because it's out of my comfort zone. But after trying it out I definitely recommend it to everyone. This polish is like a light purple and it's really pretty. I am not into loud colors so Lexington Lilac is perfect. It's a very calm color that can be worn anytime of the year. I hope you have enjoyed reading. What polishes are you loving for the Springtime? these shades are perfect for spring, my favorite is the fresh paint polish!